Carl Olivier was born in Cape Town, South Africa. Growing up just a stones throw from the ocean, he soon developed a love for the sea, surfing, windsurfing, snorkeling and fishing. At the age of 15, moving to the east coast, where his family owned a fishing boat, Carl involved himself in deep sea and game fishing, scuba diving, keelboat and Hobie cat racing, as well as surfing the Great White shark infested warm waters. He then attained his scuba and powerboat licences. High school graduation marked the beginning of 7 years of travel, visiting or working in Israel, Egypt, Greece, Portugal, Spain, France, Switzerland, Brazil and the UK. Whilst living in London, he enjoyed dinghy and keelboat sailing. Through his love of the sailing lifestyle, together with his innate business sense, he found his niche in yacht brokering. After 5 successful years as a yacht broker in South Africa, Carl went on to form his own brokerage, which he sold 5 years later, to take his family cruising. Almost 2 years and 14,000nm later, Carl has made the Caribbean his home. His decade of yacht sales experience, together with his first-hand knowledge of on-board systems and maintenance, provides his clients with a holistic sales service. 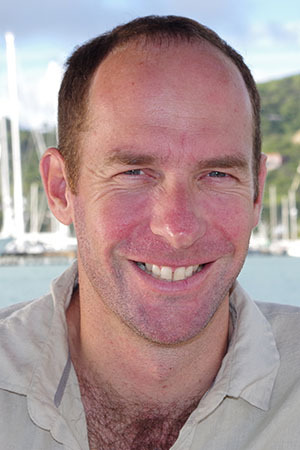 Carl continues to live aboard, enthusiastically serving 5 Oceans clients in and around the Virgin Islands. The sale of our boat went off without any problems. 5 Oceans agent, Carl Olivier, our broker had everything sorted out in time.